Yesterday I wrote a post saying that Trump is coming under the same attack that Palin did, not particularly because of their politics or accomplishments but because in the minds of the self-styled elite that populates Progressivism, Trump and Palin “are not one of us.” For people who value form infinitely more than substance there can be no greater indictment than failing “virtue signaling.” Today, I’m asking myself whether Obama read my post. I enjoy reading my Liberal-Lefty friends’ Facebook posts because they are so insightful into the mindsets of the Left. One insight that I have gained over time is that the differences between us conservatives and the Progressive/Left are so profound that they are unlikely to ever be bridged, barring some cataclysmic, life-changing events. What I have tried to do is understand why this is so. I share this with you because I greatly appreciate the insights that Bookworm group has to offer on such issues – be it “yay” or “nay”. Our disagreements appear to come down to three levels of separation. 1)	First, there are objective facts (OK, I am being deliberately redundant here). These are easy enough to resolve. Alvin Toffler’s Future Shock world has arrived: everybody is so overwhelmed with information that we can’t absorb and process all there is to know and we therefore choose our facts selectively. In discussions, factual disputes are easy enough to resolve: my typical response to Liberal /Lefties is simply tell them to “Google it”. Amazingly, many apparently don’t know that you can Google entire texts or sentences. A good example was the recent George Zimmerman trial…many people with whom I disagreed told me outright they were too busy to bother looking up facts. The Left operates on so many facts that just aren’t so. 2)	The second level of separation involves our assumptions or premises. These are tougher to resolve, because we assume and presume events based on our past experiences. I suspect that we humans are hard-wired to build assumptions (true or false) as a defense mechanism: for example, my cave ancestors probably assumed that to allow a saber-tooth tiger to stand in their path was not a good thing and that such assumption is one reason why I stand here today. We go through life building mental templates on how the world works in order to short-circuit decision making and evaluation. Otherwise, we would soon be overwhelmed with indecision. As long as our world templates work for us, we continue to hold onto them. Many formerly Liberals (e.g., David Horowitz, Bookworm) only became conservative when one or more events (e.g., 9/11) rendered their previously comfortable world views untenable. For me it was Reagan’s second term, when his policies led to the collapse of the Soviet Union and an economic resurgence. I, young man at the time, knew then that my Democrat world template had been very, very wrong. And, the older you get, the more frightening that sense of loss, confusion and failure would be. So, the older we get, the more desperately we defend our mental templates, selecting and force-fitting “facts” to fit our own perceptions of reality. I believe this is where modern Liberalism and Progressivism are today (Google “Paul Krugman”). As Thomas Sowell put it, people of the Left expect the world to conform to their misperceptions. Eventually, however, reality hits like a 2 x 4 between the brow…as in “Detroit”. I believe that this dynamic also explains the sheer viciousness expressed by many on the Left when the presumptions of their world templates are threatened (as by Sarah Palin or by black conservatives, for example). This is also the reason why I believe that world Islam will fail, because it doesn’t work and eventually people in Muslim worlds, aided by the internet, will eventually realize this (some of my Middle Eastern friends assure me that many already do). Reality is a harsh mistress. This level of separation helps to explain why Liberals and Conservatives usually talk past each other. We try to rationalize our positions to each other, but our rationalizations only make sense if the other party shares the same assumptions and understandings of how the world works. We operate from completely different templates. 3)	Faith. This the most difficult and potentially dangerous degree of separation, because it addresses fundamental values that are non-negotiable. Our “faith” defines how we perceive ourselves and our place in the world, irrespective of facts, logic and reason. I cannot, for example, “prove” the veracity of my Christian faith. Environmental extremists and atheists cannot “prove” the righteousness of their positions. We just “know” that what we believe to be true is true. There is no logical argument that I know of that can challenge faith-based values. Our values define who we are and how we perceive the world to be. Utopian fascist ideals (Progressivism, Nazism, communism, Islamism, etc. ), for example, are defined by a faith in a future to come – they require no proof. Abortion is a similar issue of faith and values – there is no middle-of-the-road compromise if you believe abortion to be murder and that murder is wrong (a value proposition). Psychologists have claimed that only very powerful shocks to the system can challenge faith. I have no dealing with the first degree of separation. I admit, however, that I am totally stumped on how to address (2) and (3). Any ideas? There is a quality to real leaders called a “command presence”. You know the type: they walk into a room and by their force of presence, command of the facts, unshaken confidence and leadership qualities, they capture the narrative and control the agenda. That command presence is a necessary mark of a good leader. In part, this is what I’ve been looking for in these debates and the most recent debate in New Hampshire helped crystallize for me what is wrong with the Republican candidates: I have yet to see a convincing command performance. I’ve seen it with Govs. Christie and Palin. I’ve seen it in Lt. Col. and Florida Congressional Representative Allen West. I thought that I saw it in Cain, Bachman and Gingrich. I’ve been especially Gingrich’s ability to control the moronic chickadees of the MSM. However, I definitely did not see a command presence when Governor Romney allowed an intellectual lightweight like George Stephanopoulos to control the narrative with his ridiculous obsession with contraception (I sense an inner conflict…care to share, Georgie?). Romney wanted to get along, to find the road to peace and harmony…so, instead, Georgie Stephanopoulos got to drive the agenda instead of getting slapped down and named for the trivial man he is. So, after that, I was pretty much confirmed in my decision to support Gingrich as the one who best offered a vision and command presence for America. That was. This is now. The fact that Gingrich could not condemn the following ad that was posted by one of his PAC tells me that, when necessary, Gingrich will readily descend into the role of the demagogue, much like those on the Left. You cannot be a proponent of capitalism while playing upon its worst caricatures for short-term political gain. This ad is vile. Romney was part of a turnaround corporation. Such companies play an important role in supporting the vitality and creative destruction and renewal of capitalist economies. As history has shown over and over again, the alternative is far worse. After this ad, I can no longer support Gingrich. We’ve already got a demagogue-in-chief. His name is Obama. So, with great reluctance, I throw my support to Romney. Anybody but Obama! 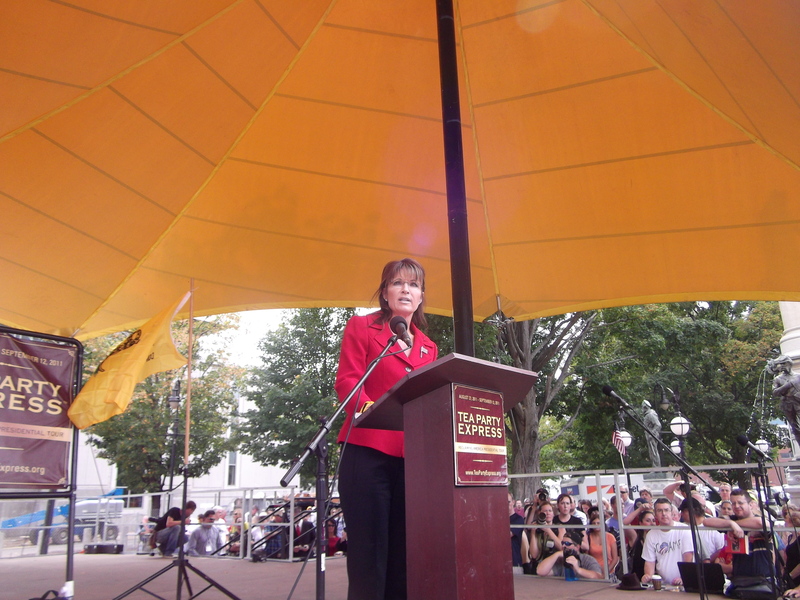 On Labor Day I attended a Tea Party Rally for the very first time and I really only went because Sarah Palin was going to speak. I am an unabashed admirer. As far as the Tea Party goes. I basically agree with what it stands for but don’t attend the rallies because I already “get it,” if you will. I work behind the scenes to help local, state, and national candidates with conservative values get elected. Judging from the comments I read in the Bookworm Room, I think most of you would agree with the folks that I work with. It is all unpaid volunteer work but it literally gives me a direct line to my representation. From dog catcher all the way up. Obama doesn’t take my calls but the next guy or gal might. The “Tea Party Rally” was a very interesting gathering of people. I have long been an observer of people. It began in the spring and summer of 1970 when I lived in New York City. On my Sundays off. I would buy a cup of coffee and go sit on bench in Central Park and just watch people. It was always entertaining. There were hippies smoking pot, little kids vexing their parents, skaters, folks feeding the pigeons and of course the ever popular crazy people who would do some of the…. well…. craziest things. One can learn a lot from simple observation. The “Tea Party” people gathered Monday were old, young, black, Hispanic, white, Asian, and Middle Eastern. They were well dressed, poorly dress, long haired, short haired, and no haired either by design or nature. There were motorcycle guys and gals with magnificent tattoos, there were business men and women, politicians, and small children. In short it was a true cross section of the American population. AND, AND, AND as diverse as the crowd was everyone was well behaved and polite, smiling and nodding as they moved about. It was easy to talk with the people there. They, like me, are absolutely fed up with what is going on in the country today and had gathered to listen to Sarah Palin and other featured speakers as well as each other. It is always interesting for me to watch news coverage of an event I have attended. Not only do I observe people I also know how to estimate crowds. The local TV news reports said Sarah Palin spoke to several hundred people. My estimate was at least 1500 or more. There you go again underestimating the crowd because after all it is Sarah Palin and the Tea party so you wouldn’t want to give them any credit. I had a very good spot and heard every word Sarah said. From where I stood my deaf old ears could have heard her without the benefit of a microphone. The local TV news reports complained that all she did was complain about the media. Admittedly she did take some swings at the media. Can you blame her? I can’t recall anyone who has been maligned the way she has. Sarah, however, spoke of many things such as ending crony capitalism, that it exists on both sides of the isle, and it needs to stop right now. She reminded the audience that she had taken on big oil in Alaska and taken on her own party in an effort to end the crony capitalism and corruption. She explained we need a President who is willing to do the same thing in Washington. America needs someone with the courage to cut the out of control spending. She even poked fun at herself reminding us of the now famous “refutiate” mistake. She does however know that there are only 50 states. Sarah Palin stood there on the stage and made people want to go out and participate in the process in a positive way. She did it with a smile on her face, a bright gleam in her eye, and conviction in her voice. She didn’t resort to name calling. She didn’t stumble during her speech, she was able to ad lib without an “umm” or an “ahh” and she was able to get back to her prepared remarks smoothly after the ad lib. Not bad for a dummy huh? Sarah Palin has been the brunt of jokes portraying her as stupid. She is not. People have wished her dead, raped, beaten and more. Her family has been threatened. Media hacks have gone through her trash and e-mails looking for the slightest minutia. She has taken everything they have dished out and she keeps on going. Lesser people would have folded. I really believe it makes her stronger. I wonder how Barak Obama would have stood up to the same scrutiny. To my mind Sarah Palin has the same stuff as Ronald Reagan, Margaret Thatcher, and Abraham Lincoln. She is brave, courageous, bold, and unapologetic about who she is and where she stands which is why I admire Sarah Palin. That is also why I got up early, got to the event early, and picked out front row spot. I wanted to see her eyes while she spoke and you can see from the photo I included with this I could see her eyes. I wanted to hear her entire speech not just what the media wanted me to hear. I have yet to meet her in person but look forward to the day that I do. I think she is the real deal. On the subject of “President Palin” I don’t know. Do I think she could do the job? Yes, I do. Her electability is the question. The media has so prejudiced the people of this country against her I don’t know how one would overcome it. It is not just the left who is afraid her. The elitists in the Republican Party aren’t too keen on the idea of Sarah in White House because she would start cleaning house and it wouldn’t matter which side of the “House” you sat in. It would seem to me that corruption is corruption in her mind. Could you imagine what Sarah Palin, Jim DeMint, Marco Rubio, Paul Ryan, and Allen West could do to turn the tide of this country for the better if they were working in concert? Finally, I think Sarah has taken too long to announce whether or not she is running. As I said I admire Sarah Palin and I see her as a person of interest in this election cycle. Maybe she will be a candidate maybe she won’t. I don’t know her mind. Being in the trenches with all the other behind the scenes people my odds on favorite and it is early but…my odds on guess as to the nominee for the GOP? Rick Perry. Governor Perry unless he does something really stupid should beat Obama in 2012. Is it just me, or does the bus tour make Obama look like a Palin wannabe? Also, do you think the visuals are going to be good when (if my predictions are accurate), he’s met by no crowds or small, angry crowds, as opposed to Sarah’s huge, enthusiastic crowds? Whoever came up with this idea sounds to me like a candidate for a good firing. This is it, the ultimate video. Every American should watch it. It pretty much sums up everything. Occasional word soup from someone in the hot seat all the time is okay, but the appalling ignorance is pretty unforgivable. UPDATE: Welcome, I Own The World readers. The great thing about my post here is that the I Own The World video is so good, not only did I post it but, virtually simultaneously, one of my fellow bloggers posted it too. The result was that readers visiting my blog were treated to the same video in two separate, back-to-back posts. The Anchoress quite correctly identifies Palin’s bus trip as game-playing. Palin, having been harassed unmercifully by the MSM since she burst upon the national political scene, is finally having her nyah-nyah-nyah moment. She’s turned the tables and is now harassing the MSM, which is very satisfying. The Anchoress suspects that Palin’s nose thumbing will not end well, and she may be right. So Anchoress is right that this may backfire on Palin herself, but I still wonder if it won’t open a door to the Republicans finally, finally, controlling the media rather than letting the media control them. Mr. Bookworm loathes Sarah Palin: “She’s not one of us.” I don’t know what he means. She’s a married mom with children. She went to college. She and her husband work. They pay taxes. She doesn’t drink (or not to excess), smoke, or do drugs (so far as we know). She’s well-groomed. She has a sense of humor. She’s interested in the world around her. She’s religious but we actually have some friends and neighbors who are religious too. Of course, she’s really religious. She actually takes it seriously. I think that’s what irks him so much. And that’s kind of what irks others about her. Or, as James Taranto makes more specific, its her moral objection to abortion, which is undoubtedly a byproduct of her religion, that drives the women bonkers. To the pro-choice crowd, abortion is the last gasp of freedom. I know this for a fact, because it’s the way I thought. Abstinence is great as birth control, but it denies a woman access to one of life’s fundamental pleasures. Birth control itself is great, except for all the problems with it: the hormonal nightmare of the pill, the mess of the diaphragm, the risk and embarrassment of the condom. When all else fails, when you’ve given in to your instincts, but the birth control didn’t work, you’ve still got abortion. Abortion keeps you from a life of less money, less sleep, less freedom, less control over your time, less self-indulgence, less time for movies, reading, dinners out, dates, etc. And all that’s after the baby’s born. Abortion also keeps you from nine months of vomiting, non-stop peeing, back pain, hemorrhoids, massive weight gain, heart burn, sleepless nights, all of which suffering is followed by a few minutes to several days worth of incredible pain. Oh, yeah! I totally get it. I really, really get it. The only problem is that the other end of this equation, the one causing the nine months of discomfort, followed by the 18 years of sleepless nights, no money, etc., is a human being. It’s a baby, a toddler, a child, an adolescent and a young adult. It is a person, whose smell is instantly recognizable to you, who turns to you in times of happiness and times of need, who constantly grows and changes, often making you very proud. It is a potential mother, father, sister, brother, doctor, soldier, maintenance person, bus driver, lawyer, good Samaritan, criminal. It is potential. It is life. These facts, the imbalance of parenting, means that those who are invested in freedom from pregnancy because it makes their own lives better (and it does) are very angry at Palin. She reminds them that, not only is another life involved, but also that one can be happy and productive, both despite and because of that other life — even if that other life is disabled. She makes liberals, especially women, feel inferior. And there’s no one better to savage than the woman who makes you feel lazy, whiny, self-centered, and ugly. I don’t have problems with calling things by their true names. So, I don’t think Palin erred in using the correct phrase — blood libel — to describe the heinous rhetorical attacks leveled against her. Barry Rubin does an excellent job explaining precisely why her word choice was so accurate. Jews have suffered inordinately from blood libels, but it doesn’t mean that they’re the only ones against whom that particularly malevolent type of falsehood is uttered. Call things by their true names. That’s part of freeing oneself with the truth. A couple of days ago, I posted a YouTube video made up entirely of tweets from Palin haters. It was a classic “unclear on the concept” thing, as the tweeters, in response to their perception that Palin’s “hate speech” caused the Tucson shooting, tried to top each other with vivid and obscene fantasies about Palin’s torture, death and dismemberment. YouTube has removed that video. I don’t know if it was a principled stand against violent threats against a politician, or a craven attempt to hide Lefty violence. Whatever. I think people need to see the ugliness emanating from the Left. The video is still on Vimeo, so I’m reposting it here. Ivory Tower used to be a compliment. Now, just as ivory has degraded in social standing (the whole death of elephants thing), so too has the Ivory Tower’s star fallen (the whole death of logic, common sense, morality and actual education thing). This morning, I posted about UC Berkeley’s buffoonish Chancellor (paid by taxpayers, both state and federal), who waded in on behalf of lunatics everywhere by opining that the insane, vaguely Leftist Loughner was a manifestation of the conservative movement. Oh, yeah! My friend Zombie now alerts me to the fact that — and this is true — since 2009, Berkeley has played host to a “scholarly,” taxpayer-funded, “academic” center that focuses on right wing movements. No, really. It’s true. Really. Unlike in the case of Oklahoma City, where the perpetrator was explicit in his insurrectionary aim and managed to pull off his catastrophe, in Tucson there is enough ambiguity about the perpetrator that radicalism on the right is unlikely to feel the need to abate. In the absence of, as it were, a smoking gun—the perpetrator himself assuming responsibility in the name of the movement—the impact of Tucson is likely to be an amplification rather than any amelioration of the fierceness of our political climate. This unintelligibility is, of course, the product of Leftist education. When I was at Berkeley 30 years ago, I drove my professors bonkers when I kept asking them to explain their Marxist claptrap. I was sufficient naive that, at the time, I didn’t know it was Marxist claptrap. As a grammarian and lover of the English language, I simply knew that it was impossible to understand the arcane words, bizarre sentence structure and illogical ideas I routinely heard and read in my classes. You couldn’t parse those sentences for love or money. Take that, oh ignorant Sarah Palin, who has the temerity to communicate using familiar words, organized in logical fashion, adding up to understandable ideas. How dare she? And speaking of “how dare she?,” somehow all this ties into Palin’s newest (alleged) rhetorical crime, which consists of using the phrase “blood libel” to describe what the chattering classes aimed at her in the wake of the Tucson shooting. Many (well, make that the New York Times) are upset about this. The paper of anti-Israel record is horrified that one of the most philosemitic politicians in America would dare to use a phrase associated with Jews. Color me limited (and Jewish), but it seems to me that she used the perfect phrase. You see, a blood libel, such as the one aimed for centuries at Jews (still aimed, by the way) is a statement that, without any proof whatsoever, accuses someone of having . . . yes, innocent blood on his or her hands. In today’s news context, to savage Palin for accurately describing what was being done to her as a “blood libel” is the equivalent of a high tech lynching. Whoops! Did I use another metaphor that is only allowed for certain races? Silly me. I thought language in America was a vehicle for communicating ideas, not for isolating (or slicing and dicing) races, classes, and victims. Our universities have a lot to answer for. In the 1960s, craven administrators, embarrassed by their possible complicity in racism, collapsed before the student revolts. Worse, in the coming years, they took those students into the fold as academics themselves, nursing the viper to their collective breasts. The result is a generation of Marxist, antisemitic, statist, incoherent people who use their academic credentials and bombastic, unintelligible writing to flim-flam the masses and, worse, to try to control the intellectual tone in this country. If you haven’t already seen it, here’s a link to the video of Sarah Palin’s response to the shootings — the actual bullets aimed at real bodies in Tucson, and the rhetorical bullets aimed at political bodies in Tucson’s wake. The beginning, with it’s platitudes about “the process of healing” (and when did mourning become therapeutic) left me cold. Palin hits her stride, though, when she quotes Reagan, and she just keeps going. I’m ambivalent about a Palin presidency, but I sure think she’s an important, clear and honest voice on the political scene, and she grows in stature with every bizarre attack against her. I posted this as a comment to Book’s previous post, but have now posted it independently as a challenge to all of us Bookworm salon aficionados. Here’s the premise: virtually all the political violence that has happened in America as come from people associated with the Democrat and/or the Left. Mass. Sen. Charles Sumner beaten by S. Carolina Rep. Preston Brooks over perceived insults made in speech by Brooks (1856). John Wilkes Booth (anti-Republican Democrat) assassination of Abraham Lincoln. Southern night riders and the KKK during Reconstruction and into the mid-1900s. (Democrats) – question: do we count each of the lynchings as separate acts of violence? Left-wing violence, destruction and physical assaults at 1999 G-20 meeting in Seattle. Left-wing violence, destruction, physical assaults and weapons convictions at 2008 Republican Convention in Minneapolis. Multiple physical attacks against Tea Party rallies by SEIU and others (2009). Physical assault by S. Carolina Rep. Bob Etheridge against student, caught on video. 1996 Centennial Olympic Park bombing by Eric Robert Rudolph (see “attacks on abortion clinics” above). Please delete, amend or add-to the list as you see fit. Or, let’s have even more fun: how about a comparable list of CONSERVATIVE acts of political violence? We shall then be able to offer two lists for posterity. Comments and contributions? Please make them as specific as possible. I have broken these out into two lists and will make additions as they come in. OK…I’m convinced. I’ve taken the Tuscon, Ariz. shooting off of the “Left” column. Israel has no greater friend than Sarah Palin. She has shown repeatedly that she has a deep and abiding respect for the Jewish state, and that she understands the existential stresses under which it survives. Benyamin Korn gets this and, despite incredible derision from Jewish Democrats, has begun working to build a Jewish coalition recognizing Sarah’s myriad virtues vis a vis Israel. As part of Korn’s effort, he has started a blog site called Jewish Americans for Sarah Palin. The website needs a bit of polishing, especially since the newest posts seem to be appearing at the bottom, not the top, which makes the site look stale, rather than vital. That’s cosmetic stuff, though, and easily fixed. What matters is the substance here, which is that Korn is trying to get American Jews past their superficial prejudices (“she’s from Alaska;” “she speaks funny;” “she didn’t go to an Ivy League college;” “she belongs to a fundamentalist Christian sect;” etc.) and instead to look at the woman’s substance. I don’t know whether Sarah is ready to be president, whether she is electable (given how much the Left’s hatred permeates society, infecting people who are casual about their politics), or whether she is actually presidential material. Only time will tell. What I do know about Sarah is that she is a truly admirable American, many of whose values resonate with me and with most Americans (even those prejudiced Jews); that she is a bone-deep philosemite, whose appreciation for Jews extends to the state of Israel; and that she is a political powerhouse who cannot and should not be ignored. So, please, check out Jewish Americans for Sarah Palin. Help make it a vital, much-read website. American Jews, how have long been on the receiving end of unthinking prejudice, need to expand their minds. They need to leave behind a Left that is increasingly, and openly, antisemitic, and they need to look to their true friends.